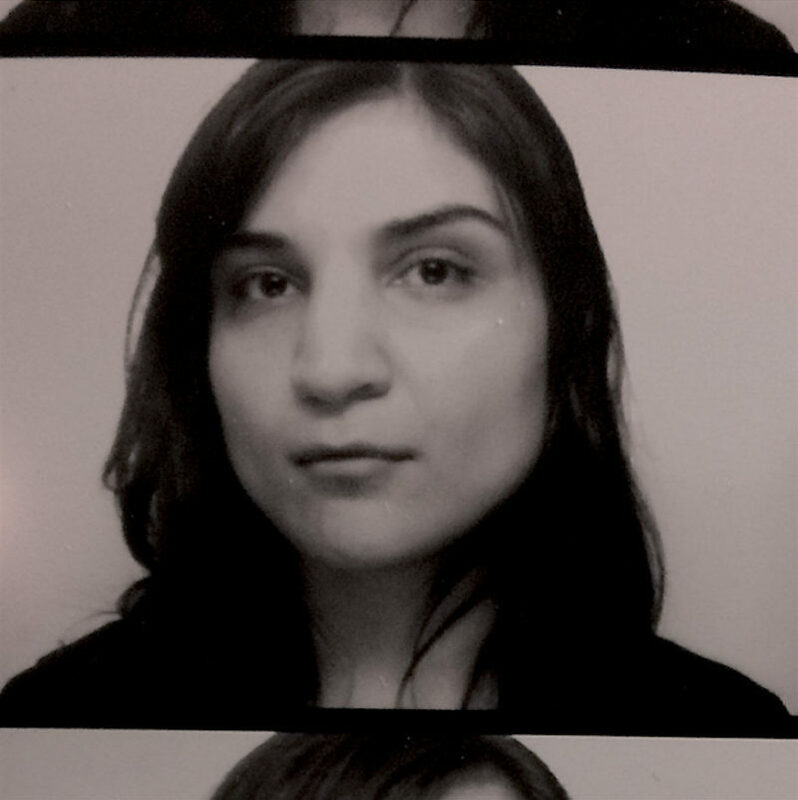 Davachi is a Canadian composer who recently moved to the East Coast. On highly acclaimed records like All My Circles Run (Students of Decay, 2017) and Vergers (Important, 2016), she researches the mystical properties of overtone and spectral music. She filters old harmonic theories by means of contemporary technologies like sound synthesis and non-harmonic arrangements. Her main instruments are legendary synthesizers, like the famous Buchla synth, or the EMS synthi, combined with organ and string arrangements. As such she can be seen as the next powerful voice in the tradition of the grand ladies in electronic music: Laurie Spiegel and Eliane Radigue. 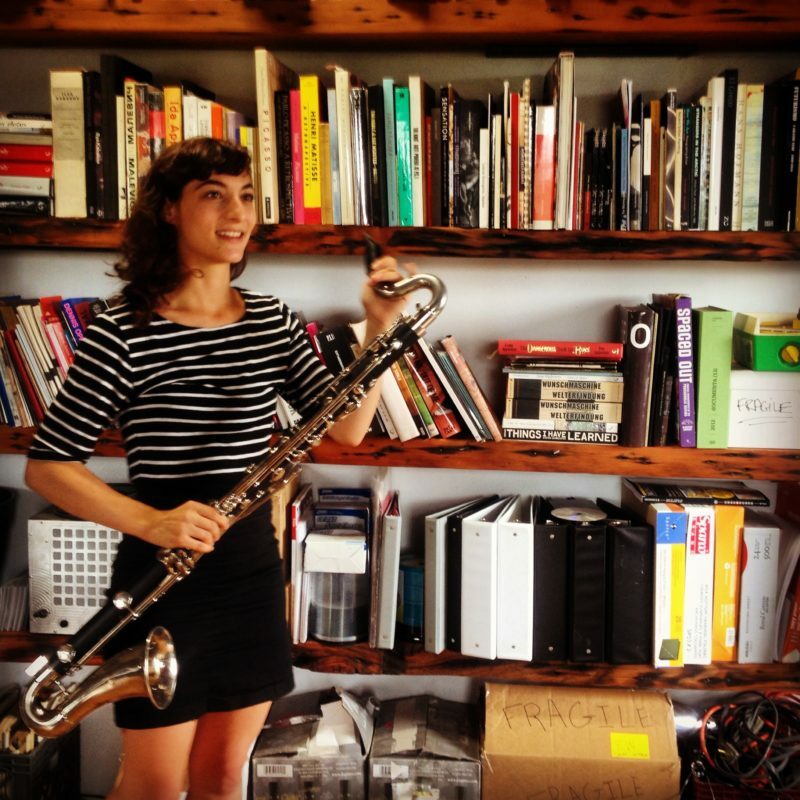 Bass clarinetist and composer Léa Bertucci in turn is the new rising star of the New York Underground. She explores the acoustics of space and harmonics through graphic scores, internal and external feedbacks and multi-channel systems. Her most recent record All that is Solid Melts into Air on NNA is a wonderful exercise in sonic alchemy, in which the basics of music are transformed into pure gold. As their work has many aspects in common, we conducted a double interview; both women asked each other interesting questions. In your work, you are both interested in the magic that happens in microtonal and overtone music: the extra tones and patterns that come into existence when creating minimalist music, tones that are very close to each other. Where does this mutual interest come from? Working with a phenomena-based approach to harmony allows my music to describe physical, psychoacoustic and subtle emotional states. I find that alternative approaches to tonality, (micro-tonal and just intonation), imbues my work with a fragile and almost organic quality (that’s why I also use tapes for my electronic sound). Many of my recent projects have involved the effects of sound in dialogue with acoustic space. The possibilities of describing an architectural space with sound are abundant when a more flexible tuning system is employed. I also think that my background in playing woodwind instruments, which allow for a lot of subtle pitch bending and microtonality, has led me in this direction musically. For me, the appreciation of the space created in microtonal/overtone and similar textural music, initially came from a fundamental rejection of the piano. It’s interesting to hear that Lea’s background performing with more flexible woodwind instruments favoured such a progression toward microtonality; I was classically trained in piano and as I felt a pull towards composition in my later teens I knew inherently that the piano wasn’t right for me due to its rigidity. I also believe that I can create a different kind of space and architecture in my music, by employing an array of frequencies that aren’t normally brought into focus in music with really active and progressive harmonic movement. I’ve always enjoyed listening to held tones — I find a simple sort of calm and clarity in the experience — and became interested in exploiting the overtones that are already buried within complex layers out of that. The sounds I like to work with are typically already there, they are just not that commonly framed as aesthetic or emotive material. What differences do you see in approach, method and outcome in each other’s work? I admire Sarah’s sounds, as they feel to me fearlessly minimal. The sustained yet constantly moving qualities of the synth create these almost extra sensory patterns. The glacial scale of the architectonic development gives the work an expansiveness which I always strive for in my own sounds. I am quite drawn to the fragility and actual time-based space that is in Lea’s work, especially in what I’ve seen of her live performances. There is a very physical presence in her recordings that I am becoming more interested in to achieve in my own work as of late, as opposed to one that is purely based on tone and pacing of changes. I also find her ability to blend many different types of textures into a coherent whole, quite impressive, as I think there are very few artists who can take sounds that are more shrill or abrupt and manipulate them to become soft and delicate. Sarah, I’d be interested to know how you decide on a tonal centre for a piece. Is it an intuitive deci­sion or based on other factors? The decision of a tonal centre is usually more intuitive but sometimes it simply depends on the logistics of the instrument I’m working with (for example, if there are notes that are in better condition or notes that are intermittent, which I know I’ll want to avoid — a common occurrence with electronic instruments). It’s a less intuitive process when I find myself working with other musicians or acoustic instruments; in these cases, I will arrange my pitch choices in accordance with more natural settings for the other performers. This is especially true with string instruments as I often try to emphasize open strings so as to ensure that I get the most uninhibited projection of inherent overtones. This reminds me in some way or another of Harmonices Mundi, of Laurie Spiegel; it’s a composition in which she applies the Kepler Theory to music. Are you interested in applying abstract, mathematical theories to music? Niels, I don’t feel that I’m learned enough on abstract mathematical ideas to apply them to music, and to be honest I’m not sure I find the concept particularly appealing in my own music (but not necessarily in other music), unless it will have a more primordial, perceptible impact. For me, bringing in that level of theoretical design can be dangerous, as it can easily detract from the quality of the overall sound, which I believe to be paramount. But maybe that’s just because I don’t believe I could handle such concepts as creatively as someone like Laurie Spiegel. That being said, I do draw a lot of influence from basic music theory and historic changes in tonal structure and harmonic progression. I’ve become quite interested in working with modal structures lately, and other examples from early music such as the circle of fifths. Of course, tuning and the strictures of just intonation are quite important in my way of thinking also, and I do look at those not just aesthetically but also from their point of departure in whole ratio relationships. Formally, I find myself becoming increasingly interested in early music and, oddly enough, certain types of religious music, especially that of Eastern orthodox practices. Again, I lack what I would consider to be a sufficient bed of knowledge in order to really say that the latter is a direct influence on my music, but the sonic experience is certainly something I would like to emulate in one way or another. I wondered, Lea, whether or not your natural/city surroundings have an impact on your work and aesthetic impulses. I find that I am increasingly influenced by my decision to base myself on the west coast; I am strongly impacted by the vast physical space of the geography and the epic nature of its design. Do you find that living on the east coast affects your choices one way or the other, or is it an irrelevant factor? My surroundings exert both overt and subliminal influence on the way my music takes shape. Although I live in a sonically dense urban space, (New York City), I grew up in a rural area (upstate New York) and have spent a great deal of time in the American west, where my father lives in a town of 150 people in the mountains of Utah. In this location, I have noticed that although the ambient noise floor is much lower than New York in terms of decibel levels, the sonic ecology is no less rich, and still contains a similar sort of density, although it is perhaps more subtle and slow. From a psychic perspective, spending time in locations with a more apparent topography, where the vast landscape is visible and open, allows a shift in my perspective. I tend to slow things down, allow for space and silences — uncertainty. I also find that I can be more focused in my attention to a composition when I am working in a rural locale. I just finished my next solo record, and was recently re-listening to some of it and realized that I was trying to cram a multitude of ideas into a rather finite space. This latest work was conceived and recorded mostly in New York, and I think that the nature of this record has a direct relationship with the dense urbanity I find myself in every day. I might have to go back and take some things out. In the past few years, I have worked on a number of site-specific and site responsive compositions, (this term site-specific for me is a bit problematic, as I feel that it is overused and often incorrect within the sound art sphere). These pieces, such as a recent saxophone quartet I wrote in a former grain elevator in Buffalo, New York, takes advantage of particular acoustic qualities of an architectural space and contains musical rules and gestures that are designed to sonically activate the site. For this piece, I based the tonal centre of the composition on the dominant resonant frequency of the space (determined by a doing frequency sweep analysis and looking at a spectral reading of the resulting recording). So here, I use a more scientific or technical method to determine the tonality of the piece, yet this approach is always in service of an emotional/humanistic expression. I do not see these things as opposed to one another, but rather in conversation together. I am interested in music that moves me, that expresses something ineffable and impossible to articulate without abstraction. For both of you, an important aspect of your music is how it relates to space and architecture. In the case of Lea’s work, it is very obvious as you have been working on site­specific compositions. One of the KRAAK artists, Köhn, also values the relationship between music and space. Where does this interest come from, and how exactly would you define this relation? I began to consider the relationship between sound and architecture more deeply when I was primarily playing amplified bass clarinet. I would mic the instrument with two condenser lavalier mics inside of the chamber of the horn. When I added gain and compression, the mics would feed back, the pitch of which would be determined by whichever keys were open or closed. As I played more shows, I noticed the nature of this feedback would vary with the acoustics of each venue, as well as my physical position in relation to the speaker. As I thought more about this phenomenon, I realized that the entire way we perceive sound is determined by the external architecture of the site as well as the internal architecture of our ears (also the internal acoustic within an instrument). So, it could be an interesting line of inquiry to explore the phenomena of subjective perception through the consideration of acoustics. One of the ways I’ve been recently experimenting with this is to consider the space as an extension of an acoustic instrument. That’s interesting to hear you say that, Lea, as I also commonly think of the physical space as an extension of the instrument, or more accurately as a filter that colours the sound not unlike a loudspeaker or a microphone does. I’ve always had an innate interest in architecture and I’ve done a lot of work and research in instrument design, which has greatly informed my understanding of the way in which objects need to be shaped in order to behave in a certain way within their intended environments (even in terms of climate control and things like that). But I suppose I became initially interested in the relationship between space and sound on a compositional and aesthetic level through my work with pipe organs. I think it’s a very unique feature of the instrument that it is designed specifically for an individual space, and that it exists only within that space. I fundamentally believe that each acoustic and most analog electronic instruments are individuals, even if they were built by the same builder or in the same factory, each one will have its own quirks. In consideration of the pipe organ in a physical space, the space itself becomes another direct feature of the instrument in this way. It’s a very special feeling to be able to play to a specific space, in a sense, and work in tandem with the unique acoustics. In the past few years, I’ve also become quite interested in early music, especially chant, and the rituals that are associated with sound in sacred spaces. Yes, that totally makes sense — the pipe organ is the original spatial instrument/multichannel sound installation! I saw Xenakis’s Gmeeoorh for organ a few years ago at St. Patrick’s cathedral in New York and was amazed by the total immersion that was created by the instrument at certain points in the piece. The fact that Xenakis had a background in architecture probably also contributed to this effect. I also meant to mention that I work at the Cooper Union School of Architecture as my day job, and I think this has definitely seeped in to my artistic practice in ways I am just beginning to realize. I am also a deep early music nerd, and am currently obsessed with Sir Thomas Binkley’s project Studio der Fruhen Musik (see Studio Der Frühen Musik – Planctus David on Youtube) ... I was reading a bit about this group, and found that they were very interested in more archaic tunings, — pythagorean etc. I just also really like the delicacy and mysticism of their interpretations of these songs. Thank you for these in depth insights in your music!